A stellar superhero romance for you! BLOOD SURFER sucked me in from the first page. I barely managed to not skip ahead to see what happened next. I’m not a huge fan of romance, so the balance between plot, action and longing glances suited me just fine. Deb Jess is an awesome world-builder. I’d gladly read anything set in her Thunder City universe. But don’t get me wrong, the romance is there, too. You will get your satisfying emotional journey. If you’re a guy (or gal) who has never read a romance but wants to be able to say they have, then this novel is for you. It captures The Avengers/X-Men feel, with the action, the characterizations and the save-the-world urgency. I stayed up late reading it. 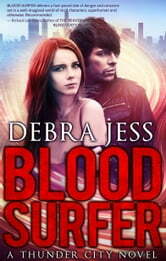 You won’t find many superhero romances out there, but Deb Jess may have started a brand new trend. I recommend it highly. Five stars!